Super Soft & Wrinkle Free. Microfiber Bed Sheets. Stuff Points: Earn 5 points when you buy this stuff. Get the look and feel of expensive Egyptian cotton bed sheets without the ridiculous price tag. These sheet sets are made from microfiber instead of cotton, so they are lightweight, but incredibly strong and durable. The material allows them to be breathable and soft all at the same time. Each set features deep pocket construction, so regular mattresses and thicker pillow top versions will all be compatible with these sheets. Once you place them on your bed, they give a look of luxury due to the sophisticated colors and silky smooth finish. Take one look at a bed with these sheets on, and you will be dying to lay down and test them out. Be careful though, because once you lay on these sheets, you may never want to get back up. These Egyptian Comfort 1200 Sheets are the perfect choice for any bedroom. At such an affordable price, you can get several sets, and always have a spare, or get a new set for every bed in your home. They are unbelievably comfortable to lay on, and easy to maintain too. As you wash this set, it will get softer and more comfortable with each load. Unlike other types of bedding, these will come out of the dryer with no wrinkles every time also. What's even better, is that due to the microfiber material, they will actually dry in less time than traditional sheets, so you will save money on your energy bill by using your dryer less. Wash them over and over, because the strong material will hold up and last for years. Make it harder than ever to roll out of bed with one of these great sheet sets. They give you the look and feel of expensive sheets without the high cost. Each set includes six pieces, which makes it an amazing value at such an affordable price. They will definitely be thinner if you compare them to a cotton set, but once you place them on your bed the difference is no longer noticeable. Because microfiber is such a fine thread, it can be thinner, and still remain strong and durable. You still get the most important part, which is the softness created by the 1200 thread count construction. The result is a silky smooth sheet that looks great, feels even better, and will last for years. Get the ultimate in comfort and luxury at a price that everyone can afford. Each set consists of four pieces, and includes the flat sheet, a fitted sheet, and two pillow cases. They also feature extra deep pockets, so they fit perfectly on pretty much every mattresses type. This makes them perfect for your new pillow top mattress or that waterbed that is impossible to find the right size sheets for. They are offered in a wide array of colors and the four most popular sizes. You are sure to find the perfect shade and fit for every bed in your home. These elegant linens will feel soft and smooth to the touch thanks to a the 1200 thread count microfiber construction. This silky soft fabric only improves with time too. As you wash these sheets they actually get softer and silkier with each and every washing. They are comparable to versions sold at local department stores, but at a fraction of the cost. In many cases you will end up paying more than double for a similar set locally. Looking for similar sheets in fun kid-friendly styles? Then check out the Egyptian Comfort Kids Sheets. How about some sheets that are a little bit softer and thicker? View the Christopher Adams 1600 Series Sheets. Order Yours Today! Color Several colors to choose from! * (white, cream, khaki, chocolate, gold, sage, sky, periwinkle, navy, gray, rose, burgundy, black ) *all colors may not always be available in all sizes. Colors not mentioned or pictured may become available in limited quantities. 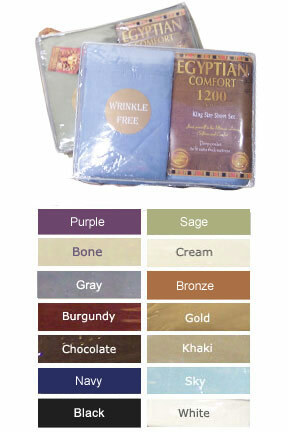 Egyptian Comfort 1200 Sheet Set - Lightweight and super soft, these sheets would be perfect for any bed. THey are made from strong, breathable fabric and are available in many great colors. Order Yours Today! Nice price on these sheets, and they feel nice. But the fitted sheet is too big for our king size matress and the there's lots of extra material. And the corner of the sheet keeps coming off the mattress. Our office made a purchase of 1 dozen sets to offset the shipping costs. Sad to say the sheets are a disappointment. They do not fit on our deep mattresses and slip right off the corners. To use them, sheet straps will have to be purchased. We also found them to be very thin. These sheets are wonderful. They are soft, big enough to cover my mattress and they are so easy to take care of. In the washer, then the dryer & hardly no wrinkles. I love these sheets. got sheets and washed them. sheets were so thin and feel so cheap. would have returned but unfortunatly through away the box. did not like them at all. I bought these sheets a year ago at a home show in Billings, Montana and I love them! I have never had a problem with them "pilling" and, despite the fact that they seem thin, they keep us warm in the winter and cool in the summer. They "breath" nicely! I went back to the home show this year just to get more of these wonderful sheets! I will be buying more! I bought these sheets at a Home Show in Montana. I was a little skeptical for the price, but I was surprised at how great they are! Cool in the summer & warm in the winter...it gets below 0° here in the winter! They are very soft, too, and they don't wrinkle! I will be buying more! Love the soft textdure. Very comfortable to sleep on. Generous sizing and cut. Would recommend and will buy additional. I chose black because I have a black comforter. It's a guy thing. We LOVE these sheets! We bought a set at our local home show and I'm buying more. They are thin as others say, but they are soft and a dream to sleep on. The construction is great, plenty of fabric for a deep mattress and a sewn panel top and bottom for extra room. Love 'em! VERY thin sheets, feel like polyester. Sides are sewn on for deep pocket, looks tacky didn't notice it in the description until now, my fault. Washed good, dried good, another reason I believe it's polyester. Mine are pilling as well. But for under $35 shipped for king size, not bad. Ordered the chocolate, very pretty rich brown. Will not order again but good deal for inexpensive sheets. I found a very small tag that says they are made in China. Guess we can't produce them in this country. Just bought a set of these sheets. They are very thin ... They are polyester or more commonly called "microfiber." The price is good for a sheet set, no matter what the quality, so I guess you get what you pay for. Just bought these sheets at the home show. They are very thin, so I don't know how well they will hold up and wasn't sure what the fiber was. One thing I am sure of is that they are soft and very warm. I think they are a good deal for the price. I LOVE THESE SHEETS. The delivery was extremely fast to an APO. I had the best sleep last night. I have one pair of expensive department store sheets and sone others that I paid WELL for and they don't compare to these. I am totally ordering more and several friends are also. I'm so EXCITED I found this site.. I JUST LOVE THESE SHEETS ! THEY WASH GREAT THEY LOOK GREAT ! AND THE THE PRICE IS GREAT ! I AM SOOOOO HAPPY! These sheets are great. If you don't mind a thiner set of sheets, they are super soft and totally worth the money. I love these sheets. I plan to order another set. They are soft and thin. I do not know how long they will hold up, but right now, they feel good. Then the light is on, they have a soft sheen almost like satin. I really like this set of sheets. Generous cut,even the flat sheet,which no one can make long enough for me. Super Soft And Wrinkle Free. With Deep Pockets To Fit Oversize Mattresses. Remarkably Soft, Totally Wrinkle-Free, And Eco-Friendly. With Deep Pockets To Fit Any Mattress. Handmade with premium wool and organic cotton. Choose from three different thicknesses. Made by hand using premium quality wool and organic cotton fabric. With two thickness options to choose from. Shredded memory foam provides the perfect blend of softness and support. Complete with hypoallergenic cover made from aloe vera and bamboo. Cozy and comfortable with knitted construction to give it an authentic look. Cozy, all-season comfort, and a luxurious look. Features an ultra plush cover and hypoallergenic fill. Available in King or Queen. Cooling gel memory foam provides maximum comfort and support to help eliminate lower back pain, and make any seat more comfy. Complete with hypoallergenic cover.